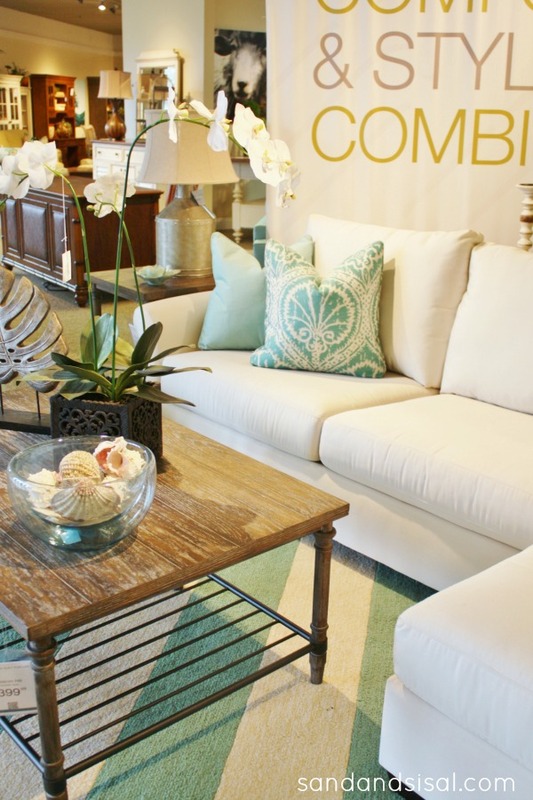 Spring is the perfect time to refresh your space and breathe new life into your home. 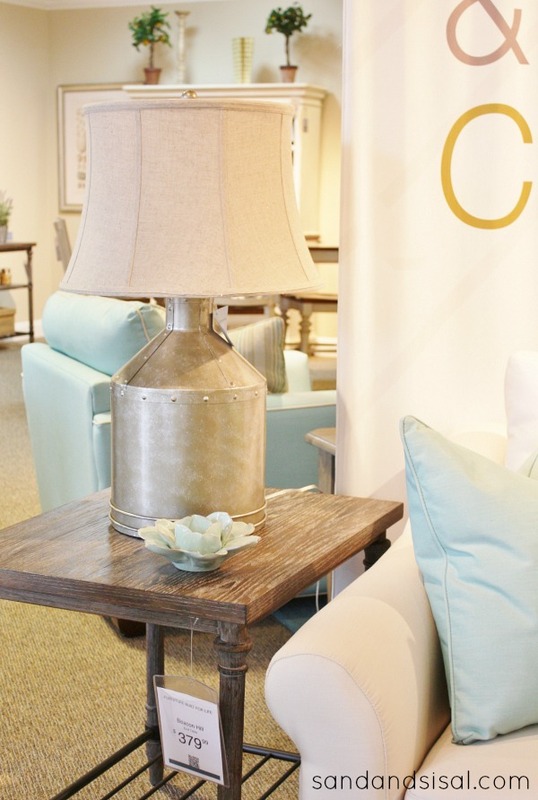 Revitalizing your decor does not have to involve a total room makeover. The easiest way to do this is with amazing accessories! I love the decor at Havertys. They have the most beautiful items, furniture, and the sweetest sales people. My daughter, Madison, and I stopped in to look for a few new items for my home office that I’m working on refreshing. Oh-my-goodness! Talk about eye candy galore! There were so many gorgeous pieces. We both were drooling over this mineral green and white living room ensemble. The sectional is covered in Sunbrella fabric which is super durable, kid friendly, and cleans up easily. 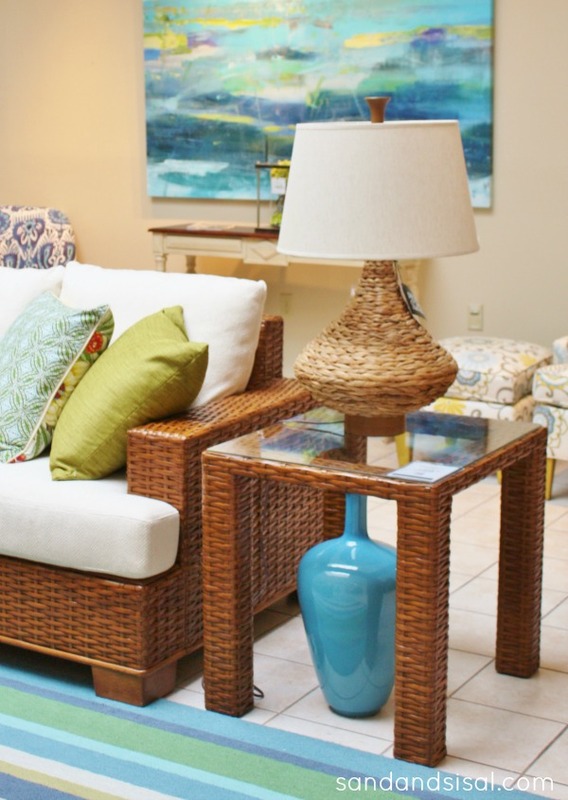 Refreshing a family room can be as simple as updating a coffee table or lamp. This reclaimed wood replica coffee table is beautiful. I like lamps that make a unique, visual statement. This galvanized milk jug lamp has a rustic, vintage charm and pairs wonderfully with the reclaimed wood table. 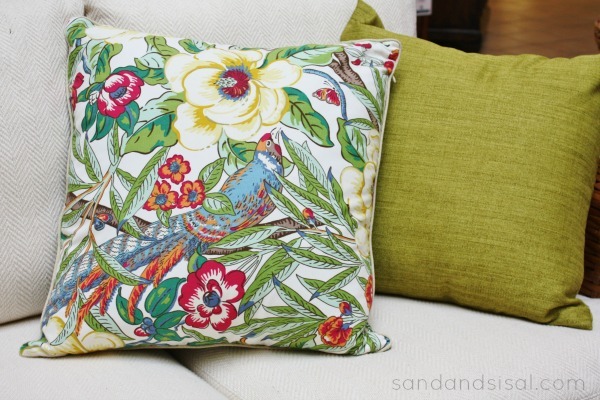 The easiest way to refresh a space is with pillows! Now Madison and I had a little design fun in the store. 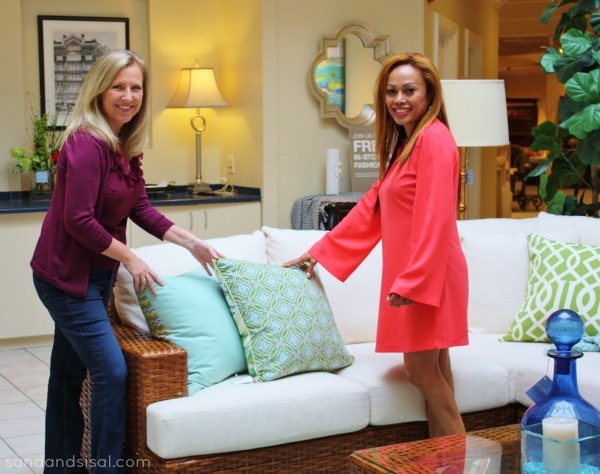 We teamed up with Havertys’ in home design consultant, Nelly Johnson, to really make this room display gorgeous! 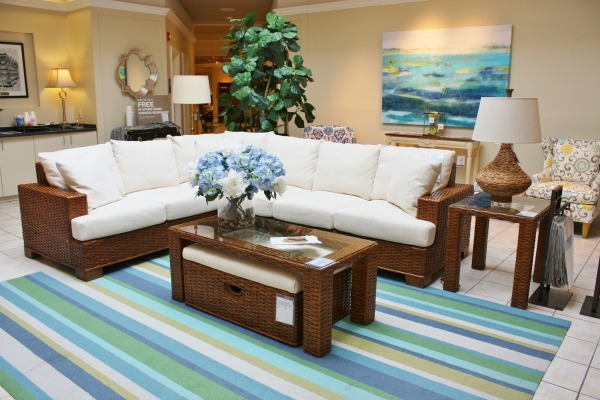 We absolutely loved this rattan sectional, but it looked a little plain. Here is the before picture below. And here is the room after! It has so much more pizzazz! All we did was add a few colorful pillows, in prints that coordinated with the celedon and aqua striped rug, and swapped out some accessories. Havertys has all kinds of pillows to choose from. I especially loved their reversible pillows. They were covered with a lovely floral on one side and a modern print on the other. 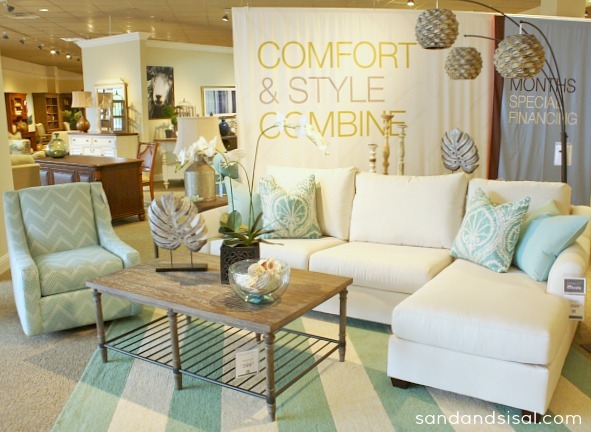 You could easily change the look of the sectional with just a simple flip of the pillow! 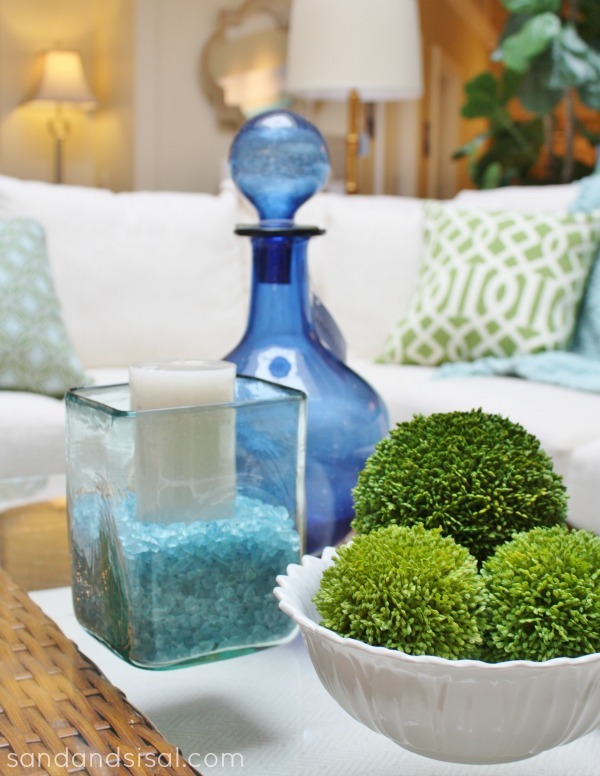 We replaced the flowers with beautiful cobalt and kelly green accessories. The grouping has interest in color, varying heights, and is rich in texture. 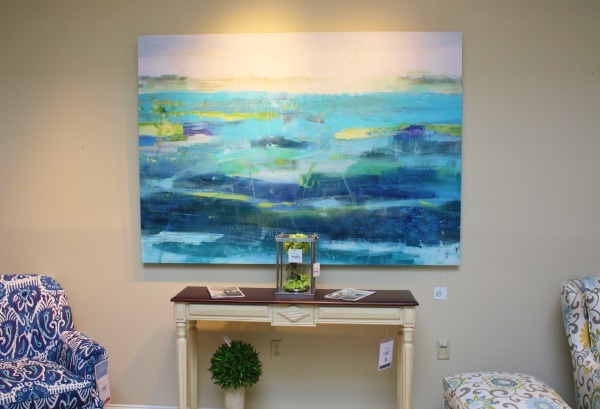 In addition to the vast assortment of decorative accessories and quality furnishings, Havertys has gorgeous art. We had so much fun playing and changing up the look. Nelly, was so helpful and knowledgeable too. 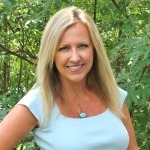 I learned something new about Havertys too, if you are purchasing a piece of furniture, you can have their in home design consultant come to your home for a design consultation. And this service is free of charge! What is so nice about Havertys compared to other home furnishing stores, is that they provide a low pressure, relaxed shopping environment. They greet you right away and inquire and listen to your design needs, but if you just want to browse, they totally give you space, which I appreciate. 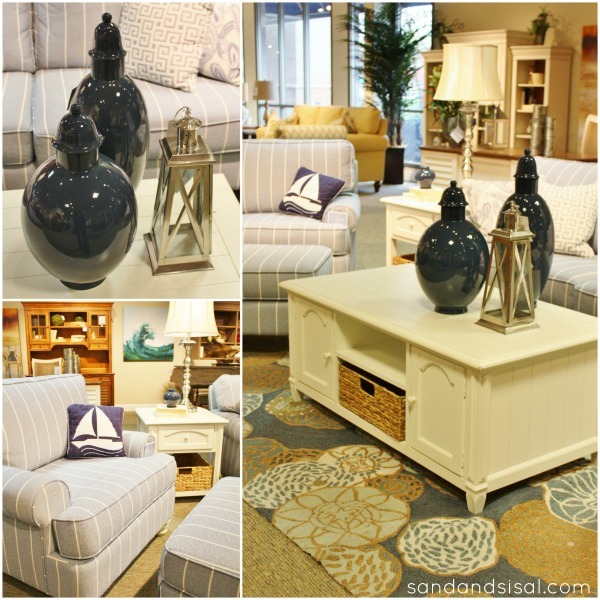 Because we are a beach community, I was very please to see all the coastal cottage furnishings to choose from. 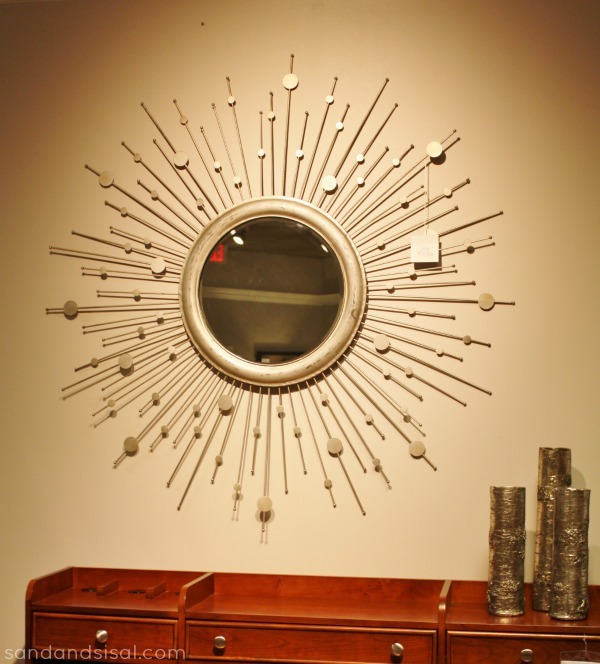 They also have a wide range of electric and contemporary pieces, like this amazing sunburst mirror and silver birch log vases. 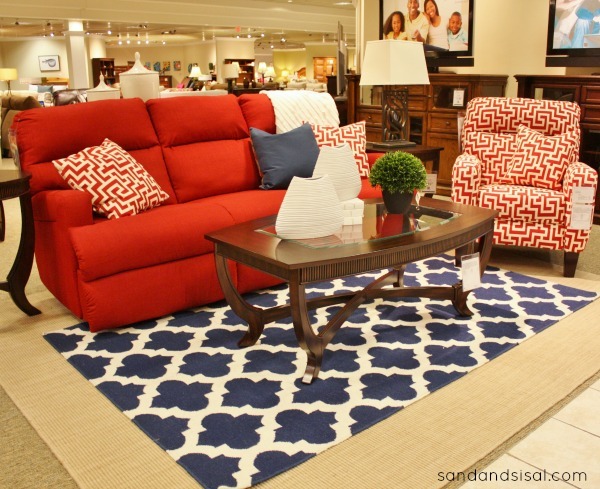 As we were leaving, we passed by a cheerful casual family room arrangement in red, white, and blue. Here is another example of refreshing a space. You can take a solid colored sofa, and dress it up by pairing it with a chair upholstered in a bold and graphic printed fabric and matching throw pillows. 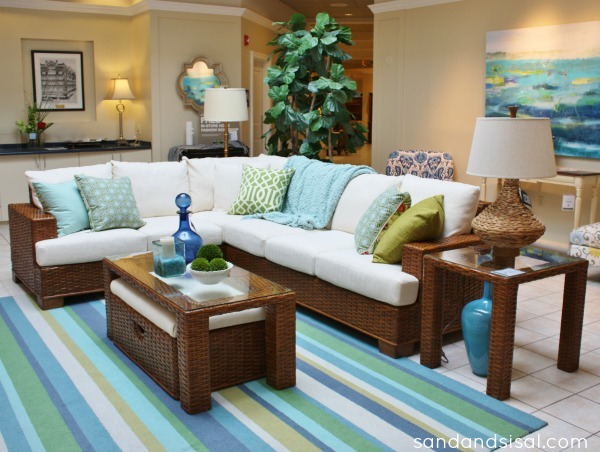 Layer a smaller, colorful rug over a larger, natural sisal area rug for added interest. Do you see any items that caught your eye? Ready to refresh your space? Well guess what? You are in luck! Havertys has two big sales this spring, their Anniversary Sale (April 22- May 4) and the Memorial Day Sale (May 12- 25). They also host home fashion workshops every other month. The next one is June 14th is covers “Decorating ABC’s”. You can read about the home fashion workshop I attended last fall. Click HERE to find your local store. You can connect with Havertys here: Facebook, Twitter, Pinterest, G+, YouTube, blog.